There are many food specialities for the New YEAR in Japan. In Alphabetical order of the Japanese. Use your browser to find a word, please ! The Japanese New Year lasts for three days, when the housewife is not supposed to do any cooking, except for the New Year Soup. So all is prepared in beautiful boxes (jubako 重箱) and served to the family and to the many seasonal visitors. Sharing the food with visitors was the custom called kuitsumi 食摘み, くいつみ during the Edo period. There are usually three layers of the boxes, the first contains the entree and hors d'oeuvre, the second has the fish and the lowest one the boiled vegetables. Sometimes there is a fourth box with more side dishes. Most dishes are choosen because they are "engi ga yoi", auspicious of some kind, with a pun. Japanese are very fond of engimono of all kinds.
. Engimono 縁起物 little things for good luck . Collectively known as osechi ryori, these dishes are served generally on the first three days of January, usually at breakfast, when the whole family is together. Tradition has it that they will bring good health to all throughout the year. This cuisine is beautifully arranged in tiered lacquered boxes called jubako. The name of each osechi food has a fortuitous meaning, either through a play of words or the resemblance of the food with an auspicious item. Kazunoko (herring roe) symbolizes prosperity for one's descendents because this delicacy consists of many eggs. Kuromame (black boiled beans) symbolizes being hardworking or industrious. Gomame (small dried sardines) symbolizes a bumper crop or rich harvest. Kobumaki (rolled seaweed) symbolizes pleasure or delight. Ebi (prawn) symbolizes a wish for long life. Another New Year's favorite is ozoni, a soup containing sticky rice dumplings (Omochi). Every area has its own recipe. People from the Kanto district, for example, like the soup seasoned with soy and square rice dumplings, while people from the Kansai district prefer soup made with miso (fermented bean soy paste) and round rice dumplings. A typical dish of Kyoto and the Kansai area. Radishes and turnips are used most often and some cut kombu seaweed and carrots are added. A special vinegar brew with soy sauce, sugar and sweet ricewine is added (sanbaizu 三杯酢). It is often eaten at the end of a course. The shell has the form of half a circle, with some black spots. It ressembles the tanishi shells of the rice paddies, but is a bit longer. It lives in the sandy beaches of many bays. The white flesh is boiled in sweetened soy sauce. The shells are used by children as spinning tops. nishizakana 螺肴 (にしざかな) , conch snacks. The roots are colored with red shiso perilla juice to make an auspicious color. They are often served together with black beans. This plant has been introduced from China during the Edo period. It is alse a medicinal plant and now available during the whole year. It is often placed above the kagami mochi. This decoration was used for the ceremony of . . . "strengthening the teeth", hagatame . 歯固. The radish can also be put into zoni soup later. Radish is a typical vegetable of winter, good for digestion and has been the subject of Japanese poetry since olden times. Radish (daikon) Pickled radish, takuan. Fukucha ... 福茶 "Good Luck Tea"
Introduced after the Meiji Reformation. The Emperor meets with the politicians for a first audience and exchanges a glass of ricewine. In the Phoenix Hall of the Imperial Palace. Now it can be held on any of the first three days of the new year. The menu was composed first in the Heian period and is still served today. Rice flouer was kneaded into the shape of plum branches. They were fried in oil before serving. The same as the plum branches, but in a different form. Snacks kneaded with wheat flour, in the shape of a scorpion (蝎 すくもむし sukumomushi). They were either fried or steamed. Also called kappei かっぺい. pei ぺいwas another word for mochi 餅. Wheat or glutinous rice flour and medical cinnamon where kneaded into a form of a three-cornered priest hat. Fried in oil. made from flower, rolled round like "bullets", or round "like satoimo potatoes", then fried or boiled. dumplings with a shape of the human navel. Made from flower, then fried. Made from rice flour mixed with foxtail millet (awa) and millet (kibi). Round and flat types of bisquits, almost like our rice senbei these days. Also a kind of mochigome 糯米 is used. Made from wheat flour and flour of green beans (edamame), with some poppy seeds (keshi) and dried lotus. Fried in sesame oil. Today they are still used as offerings in Buddhist rituals. Modern seijoo kankidan 清浄歓喜団 have the ingredients wrapped in the dough like a pouch. The oldest form of the noodles, sakubei, produced by adding rice powder to flour, was introduced from China in the eighth century. Now we have udon and soomen nodles. Wheat flour and rice flour are mixed, rolled round and fried in oil. The beginning of our senbei. Wheat flour is kneaded and rolled flat until they are all of the same size. Tooshi Chooja of the Fujiwara clan ate them always at the shrine Kasuga Taisha. Now they are called Hootoo ほうとう, a kind of udon, a speciality of Yamanashi pref. The above types of snacks were also introduced from China in the Heian period. There are eight famous snack from China (hasshuu no karagashi, yakusa no kara kudamono 八種の唐菓子, 八種唐菓子). This custom of serving them shows the strong influence of the Chinese culture on the aristocracy during the Heian period. The lists do differ in including various snacks. They are mostly made of rice or wheat flour, kneaded into auspicious shapes, filled with minced meat or vegetables and fried for consumption. They were also called "fruit" kudamono 果物. KU meand KI, tree, "ki no mono" like nuts. These snacks were made from the fruits of trees also. Another old meaning of KUDAMONO is "fish snacks to be eaten with ricewine". Japan sent envoys to the Sui and Tang Dynasty from the Asuka period to the beginning of the Heian period. 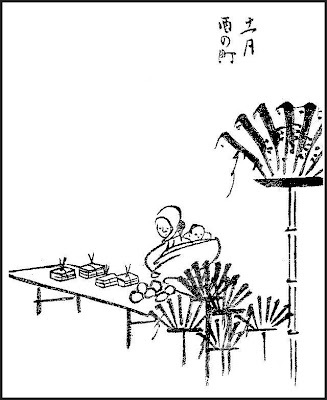 They brought back eight Tang confectioneries (唐菓子 ,Tō-gashi or kara-kudamono) and 14 grain flour-based confectioneries (果餅) and the recipes. The Tang confectioneries were kneaded wheat flour and rice flour, and fried in oil. These were more advanced than the confectionery technology of Japan in those days. They were served at the Imperial Court and offered to Shintoist and Buddhist deities. According to one view, a dark brown sugar was also brought back from China by Jianzhen who came to Japan from the Tang in this period. However, since sugar-refining technology was not introduced to Japan at this point, the sugar was very rare and was treasured like a medicine. Generally, the syrup that resulted from boiling the sap of Grape ivy down (甘葛煎 ,amazura-sen) was used as a sweetener at this time. During this period, many diaries and tales were written among upper class and aristocrats. The Tale of Genji, The Pillow Book and The Diary of Izumi Shikibu have some episodes about confectionery. Moreover, the records manifesting a life situation also increased with improvement of a government institution. They are how we know confectionery culture of those days. Major eights: Baishi, Danki, Hichira, Kakko, Keishin, Tensei, Tōshi and Tsuishi. Others: Buto, Fuzuku, Heidan, Hōtō (According to one theory, it is an archetype of Hōtō hootoo), Kakunawa, Konton, Magari, Mugikata and Sakuhei (sakubei). Aozashi: It is made of parched green wheat flour and twisted like a thread. Kezurihi: Shaved ice flavored with amazura-sen syrup. It is called kakigori today. 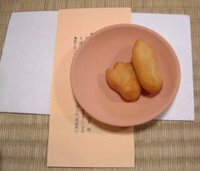 Tsubaki mochii: A mochi flavored with amazura-sen syrup. Inoko mochii: A mochi shaped as a wild boar piglet. Small dried sardines, broiled in sweetened soy sauce. They are also served on other felicitous occasions. During the Edo period, farmers prepared fertilizer for the fields from small sardines and ash from the hearth. These fish are eaten with the wish for a bountiful harvest. hatsutawara 初俵（はつたわら）"first bundle of rice"
Prepared from roasted glutinous rice (mochigome). The result looks like a white "flower" of the rice. It was often served to visitors. It was often placed on a special decoration shelf (hoorai dai 蓬莱台) which symbolized the Buddhist mountain Horai in China, where people would live forever. This custom has died out, but even nowadays some of this popped rice is sold at the festival of some temples and shrines in Osaka. komebanatoo 米花糖 sugar like "rice flowers"
in the colors green, yellow, red, pink and white, which looks gaudy. Some beans open a bit when boiled. They are picked out especially and added on an extra dish. This is a word play with "opening the good luck", kai-un 開運. The long burdock roots are inscised various times and boiled long as they are. They resemble the divining sticks of temples and shrines. Sometimes the burdock is crushed. Sesame is added for flavor. Wish to become as strong as the burdock root in the coming year. In Kansai, it is used instead of kuromame black beans for the three side dishes (mitsuzakana). This is a pun with the word "kashira", being the head of a group, and is therefore considered auspicious food. It is either put into the zoni soup or prepared boiled as a side dish. Their decorations are full of auspiciuos symbols. Herring roe. Herring is also called "kado" in the language of the Ainu. The name derived from kado-no-ko "children of kado fish". it comes dried or salted and is a MUST for the New Year. Because there are millions of eggs in a herring ovary, it symbolizes good luck with many children and generations of the family. A prepacked cake of this kind is also sold at the New Year Fair "Tori no ichi" at Asakusa, Tokyo. A roll of tang containing dried fish simmered in sweetened soy sauce. A play of words with yorokobu, to have pleasure, to enjoy something. Some saijiki do not list this as a kigo. Typical New Year Food of the Kanto area. Fish of medium and small size are placed in a foxtail millet pickles mixture. This preparation can stand for many days and is therefore suitable for the cold food of this season. To get rid of all the small bones the fish is cut into three slices and salt added to the pickles mixture. When take out of the mixture, it is simmered in sweetened vinegar. Rice and food to be shared with visitors. Includes chestnuts, dried persimmons, soure oranges, konbu seaweed, popped rice and dried abalone. All this food represented auspicious symbols for the new year. mame also means diligent hardworking and healthy, so the beans are eaten with the wish to stay healthy and not experience any disaster in the coming year. It is placed in the "Lucky Tea" and the zoni soup. A play of words with yorokobu, to have pleasure. A thin strip of dried abalone wrapped in folded red and white paper or served on a piece of green bamboo. It used to be eaten, but since the Edo period became a piece of decoration. Because the meat of the abalone tends to strech long, it is a symbol of the long and good human relations. Now even paper imitations of a noshi can be used. The fish is salted and kept in a pot with a heavy stone on the lid for pressing. This food was used for the ceremony of . . . "strengthening the teeth", hagatame . 歯固. Because of its fast growth during just one year it is auspicious to eat it during the New Year days. It is a speciality of the Tosa area of Shikoku, but now eaten all over Japan. It is also called "fish of one year", nengyo 年魚. It is now the prefectural fish of Gunma. Beside the main tray with New Year food, there are two small dishes, one on each side, which contain some beans or other vegetables. This is an old custom of decoration from Kyoto. Sometimes they are also placed on both sides of the zoni soup container. Open soybeans, open burdock and fern are used most often for these dishes. During the season of the New Year and O-Bon, on the sixteenth day,the memorial day of Enma, King of Hell, everyone took a day off and fasted. Servants and monks and sometimes even the prostitutes were sent home for a general holiday (yabu iri, yabu-iri 薮入), so the stores closed early and most people stayed at home with the family. Holidays like this for the servants were not common during the Edo period, where they had to work seven days a week the whole year.
. The First Lunar Month　一月 ichigatsu - in Edo . Sakuo san translates "jigoku no shuu" not as the demons, but the humans that had fallen to hell after death and are usually maybe eaten by the demons. These poor sould had a day off, since the demons and all else were on a fast. This hokku was written in Edo on 1/22 in 1804, so Issa is imagining, probably based on a memory or on something he has heard, a scene near Kyoto on 1/16. The 16th is the day when servants are allowed to return to their parents' houses to celebrate New Year's and when wives who live some distance from their natal homes return home for a day. Before Japan imported its lunar calendar from China, the day of the first full moon of the year, 1/15, may have been more important than 1/1, when the lunar year begins on the Chinese lunar calendar. By Issa's time, however, marriage had become patriarchal under warrior-class rule, and 1/1 was called Big New Year's and 1/15 was called Small New Year's. The latter was also called Women's New Year's, onago no shougatsu, and in rural areas women generally became a year older on 1/15, while men became a year older on 1/1. Both 1/15 and 7/15 were times when ceremonies were held to welcome back the spirits of the dead, and the return of wives and servants was originally for the purpose of greeting the spirits of their ancestors together with their families. On the other day of returning home, 7/16, people who went home were able to join in the ceremonies to greet their ancestors, since the large O-Bon Festival of Returning Souls was held from 7/14 to 7/16, but probably because there were two New Year's Days in the first month, Big and Small, those who returned to their hometowns on 1/16 were too late to join in the ceremonies for ancestors on 1/15. This is the situation Issa's hokku assumes. Women from the villages around Kyoto were in great demand in the city, where they were hired as servants and maids and given lessons in "high" culture by aristocratic and merchant families, and the majority of returnees from Kyoto to the countryside around it were women, so I'll refer to the servant or wife who returns in Issa's hokku as "she." The woman's parents live a few miles south of Kyoto near Mount Otoko, literally Male Mountain. On that mountain was a very large and famous Shinto shrine and Buddhist temple complex (in Issa's time Shinto shrines and Buddhist temples were usually located next to each other and shared the power of the place), with the shrine being dedicated to Hachiman, the god-bodhisattva of shamanic flags, bows and arrows, and rice paddy fertility. The shrine is called the Iwashimizu Hachiman Shrine, and the woman's family probably made a pilgrimage up the mountain the day before and watched sacred kagura dancing by the shrine's female shamans, whose dance was believed to welcome back the returning souls of ancestors on 1/15. The woman's parents may also have prayed at a large bonfire on the night of 1/15 in which all the implements and decorations used at Big and Small New Year's were burned and thereby sent back to the other world. By the time the woman returns to her home on the 16th, the ceremonies and festivities have finished, and she is unable to greet her own ancestors' souls directly, when they descended to the shrine. All she can do is pray from a distance, after their souls have returned to the other world. She must be very glad to see her family, but she also feels a day late and a bit empty. If she is a returning wife, then on 1/15 she probably had to go with her husband to pray to her husband's ancestors, so the sense of returning late must make her return bittersweet.
. Kagura Dance - Sato Kagura 里神楽 of Shinto Shrines . Four grilled sea breams are put on a plate with the heads and tails up. This kind of decoration is also used for other celebrations. A sip of this mulled wine will bring long life! It contains the extract of various spices and herbs. The toso spices mixture originated as a prescription of the famous Chinese physician Hua Tuo in the period of the Three Kingdoms. It contains Japanese pepper, rhubarb, Chinese bellflower, Radix asiasari, Apiaceae or Umbelliferae, cinnamon powder, dried ginger, Atractylodes Japonica and a few others. 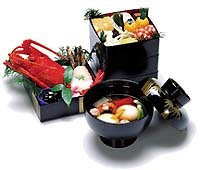 Mixed vegetable soup for the new year is eaten on January first in the morning, usually after the first shrine visit and prepared with the first well water (wakamizu, see below) . In Western Japan, it is the custom to add a lot of yellowtail (buri) to the broth of vegetables. The soup is seasoned with white miso and the mochi are round. In Kanto the soup is prepared with soy sauce and the mochi are square. What did you eat in your zooni? After that, no hot food was eaten until January 4, to give the housewive and the kitchen and hearth deities a short holiday. Every family has its own recipe of how to prepare it, handed down from mother to daughter as the "taste of mother". First Water, "young water" (wakamizu) Japan. Including more kigo of this water-drawing ceremony. from the Iya valley, Tokushima. With ishidoofu 石豆腐 "stone tofu". from Iwate, where the mochi are dipped in a thick sauce of ground walnuts and miso paste. from various regions of Japan, you only have to poor some hot water on the mix in the plastic pot. The perfect treat for a lonely-living person in our modern world. a speciality of the Noto peninsula and Sea of Japan coast. They are prepared as sashimi, sushi or tsukudani broiled in soy sauce. They taste rather sweet. Children used the empty shells to play with. Die ostasiatische Meeresschnecke (baigai) ist in gesüßter Sojasauce gekocht eine besondere Delikatesse. Die armen Bauern der Edo-Zeit verwendeten stattdessen Teichschnecken aus den Reisfeldern. Die Schneckenhäuser dienten den Kindern als Kreisel für die Neujahrsspiele. Chikuzen-ni 筑前煮 "boiled vegetables from Chikuzen area. It reminds us of the daimyo Date Masamune, who always wore a gaudy outfit. So we can wear it at least once a year. and MAKI is maku, rolling in new culture and education for the future, also becoming more intelligent in aquiring such education. A pun on the word katsu 勝, to win. These dishes were also served when a samurai returned home victoriously. Brings wealth for the coming year. The yellow color reminds us of golden pieces of money (koban). Since its buds sprout quite visible, it is an auspicious food for "me ga deru", to have good luch (eyes coming out). It can be cut with six corners to resemble a little bell. usually koohaku namasu 紅白なます in the auspicious colors red and white. It is an auspicious food,since you can see through the holes of the root "into the future", saki ga mitooseru　先が見通せる, mitooshi ga kiku 見通しがきく, which is lucky. Therefore lotus dishes are always prepared for auspicious situations, festivals and the New Year food. Wish for a good harvest. Seasoned with sake, mirin and white sesame seeds. auspicious pun about striking an enemy down (utsu 打つ). These dishes were also served when a samurai returned home victoriously. The middle part is thickest. To use them for eating brings good fortune to the kids and grandkids and more descendants. yatsugashira ヤツガシラ / 八つ頭 "eight eight heads"
Just as this parent potato has many child potatoes (sprouts), we eat it with the wish for many children and further generations. is a special kind of cake made of stick rice. Eating nian gao symbolizes elevating oneself higher in each coming year. New Year's is the most important holiday on the Japanese calendar. And as befitting such an important festival, the food traditionally served is lavish and elaborate. At the centerpiece of the New Year's feast, which traditionally went on for as long as seven days, is osechi ryōri, a colorful spread packed into multi-tiered lacquered boxes called jūbako. The custom of serving a feast in layered boxes or on several decorated plates has been around for at least 1,000 years, but the current form of osechi ryōri was established in the late 19th century, during the Meiji Era. Each item that is included has symbolic meaning. The shiny black color of kuromame (stewed black soybeans) wards of evil humors and illness, and keeps the body healthy and hearty. Tazukuri (tiny baby sardines cooked until they are crunchy and sweet) symbolize hope for an abundant harvest. Kazunoko (salted and marinated herring roe) is a symbol of fertility, as is kobumaki (herring wrapped in konbu seaweed and stewed). It's not all just about the body, either, but quality of life. For example, datemaki (a rolled omelette containing fish paste) symbolizes learning and academic achievement, since it looks like a rolled document, while the golden color of kuri kinton (sweet-potato paste with stewed chestnuts) symbolizes a wish for wealth and good fortune. 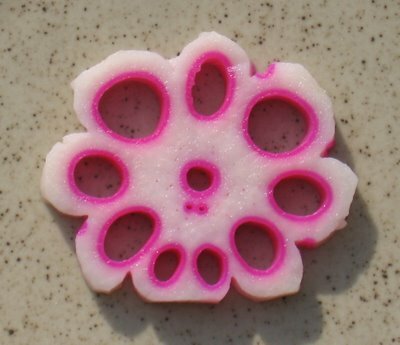 Meanwhile, the see-through holes in sliced lotus root, a part of the simmered-vegetable dish called onishime, represent a wish for good foresight. Even the fish and seafood that are the stars of osechi ryōri are significant: Ise ebi (spiny lobster) symbolizes longevity, since it lives so long and because of its trailing "whiskers"; buri (yellowtail) signifies a wish to get ahead in life, since it's a fish whose name changes as it gets older; and tai (sea bream), which is usually presented grilled on a skewer so that it looks like it's still swimming, is considered lucky because of its name, which is part of the word medetai — auspicious and joyous. Suffocating on osechi, Japan’s selection of traditional New Year’s dishes, really does happen. Which is why Osaka-based food manufacturer Fukunao Medical Foods Co. is holding an event on Dec. 7 where osechi cuisine specially prepared for people with chewing problems and dysphagia will be available for tasting. Osechi often includes grilled sea bream, kamaboko (broiled fish cake) and tazukuri (dried sardines cooked in soy sauce and sugar). But with Japan’s rapidly aging society, it’s come to light that some of these dishes are troublesome for those with difficulty chewing and swallowing. Every year, there are reports of the elderly who have choked while trying to swallow mochi (sticky rice cakes), a popular part of the New Year’s meal. Fukunao is revolutionizing the traditional meal by creating what it’s calling “yawaraka” (soft) osechi. Some of their innovative dishes include easy-to-swallow mochi, extremely-soft kamaboko and sea bream prepared in such a way that even its bones are soft enough to eat . . . This hokku is from the Pale Blue Sky (Asagizora) anthology of hokku from the later part of Issa's life. Shian-bashi was a famous bridge in Edo that had to be crossed in order to reach one of the city's main entertainment districts, an area that included a theater district with both kabuki and puppet theaters. The bridge's name literally meant "the bridge on which you have to think very hard and make the right choice(s)." In Issa's time the name mainly meant either 1) that when you get to this bridge you have to decide whether you really want to spend a lot of money on entertainment or whether you ought to turn around and go home and lead a thrifty life, or 2) that by the time you cross the bridge you need to have made up your mind what you're going to do and see, since otherwise you'll be overwhelmed by the countless theaters, tent shows, restaurants, tea houses, special tea houses for trysts, unlicensed brothels, sermons, street artists, and lots more. Most houses and shops gave their servants and employees two days off a year. The first was in the middle of February at Little New Year's and the second at the Bon Festival of Returning Souls in early autumn. The word for these two days off literally means "visiting the rural house of your parents among groves and thickets," since many servants and employees in Kyoto came from the area immediately surrounding Kyoto, and on these days they would return home to see their parents and pray for their ancestors. Edo was a very large city, however, and many of its servants and employees were, like Issa as a boy, from rural areas hundreds of miles away, so returning home for one day was not an option. In the hokku Issa evokes a pair of servants or employees, probably from the same house or shop, on one of their precious days off. As someone who had probably worked for a while as a servant or employee himself, Issa and many of his readers know how excited the two people must be. As they cross the bridge they don't walk casually but walk side by side thinking out loud and debating what they really want to do today. Perhaps in the hokku they have stopped and stand in the middle of the bridge discussing things until they make up their minds. There is so much to do, yet they have so little time and money. Actually the two people may wish most of all that they could just see their parents today, since they've been away from home a long time. Perhaps the fact that the two people walk together through a big Edo crowd is meant by Issa to imply that what they really want most is what they lack most in the big city: warm friendship and comradeship. And of course the name of the bridge suggests it is a figure for life itself. At the entrance to the pleasure quarters, like Yoshiwara in Edo or Maruyama in Nagasaki . . .
Men had to ponder, go there or go back home ? ??? Since people were not supposed to cook on the New Year day, the vendors were very busy. Issa lived in Edo, Hatchobori, when he wrote this haiku. She reached the River Nagara. from the New Year . . .